needs fervent prayer, at this time. that they suspect may be due to a condition in his brain. and take the time to lift this little fellow in prayer? The family would sincerely appreciate your prayers. And, please pass along this prayer request to other prayer warriors, if you will. Steven and Shyla's son, Max Brown. "I just wanted to let you know some very exciting news. told us today that they think he is ready to come off now!!!! and has been for over a week now!! and if he passes both we can finally say good-bye to that vent for good!! it was never above 97. Today with the vent off his o2 was 100!!!" Did you catch that, my friends? With the ventilator OFF, Max's oxygen level was 100%!!!!!!!! PRAISE OUR WONDERFUL, AWESOME GOD!!! And, did you notice anything else? Max is sitting up all by himself!! The picture you are looking at presents a Divinely-orchestrated miracle! The doctors said this was impossible. 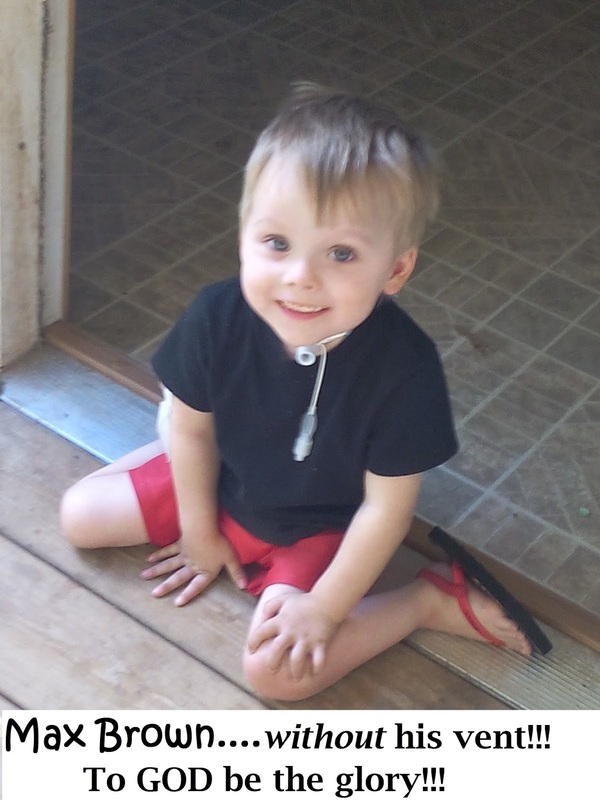 They saw no future for Max, outside of living the rest of his life connected to a ventilator 24/7. Praise God, the doctors do not have the final word! right in front of their eyes and the eyes of the world. specifically for the healing of our physical bodies. Who says the days of miracles is past? Who says miracles were only meant for the time Jesus was living upon the earth? Praise God, that includes Max Brown. the next miracle we must bombard Heaven for is that one day he will no longer need the trachea. We look at these situations as insurmountable impossibilities in Max's path. God sees them as small and easy to fix. All it takes is faith the size of a mustard seed. and it shall remove; and nothing shall be impossible unto you." and He is still on His throne, listening for and answering the prayers of His children. "For the eyes of the Lord are over the righteous, and his ears are open unto their prayers..."
I can only imagine the wonderful plan God has for little Max's life. because I know it is going to be amazing! To read the previous posts on the Brown family, click these links. and The Brown Family - One Year Later. and please pray hard for Ryker. is still able to do "exceeding abundantly above all that we ask or think." Lifting little Ryker up in prayers. And way to go Max!!!! Continued prayers for and your sister. I will also keep praying for all of the other sick kids (adults as well) mentioned on your website as well, Cheryl. God bless you. Thank you so much, Carol! You have been so faithful for this dear family since the beginning of their troubles. Bless you for being so kind! Always grateful to see that you have stopped by here, dear friend. Sending you much love and encouragement today! Yes, I will pray for Ryker. This family has had so many trials ~ I pray God will continue to work in all of their lives. The video was so great. Thank you for sharing it. Oh, dear friend! They surely have endured much heartache. It was so sweet to see that you had stopped by and left encouragement behind. I pray for you and your family often and hope all is well with all of you. May the blessings of the dear Lord overshadow you daily. Love and appreciate you and your sweet friendship so much! Wow. 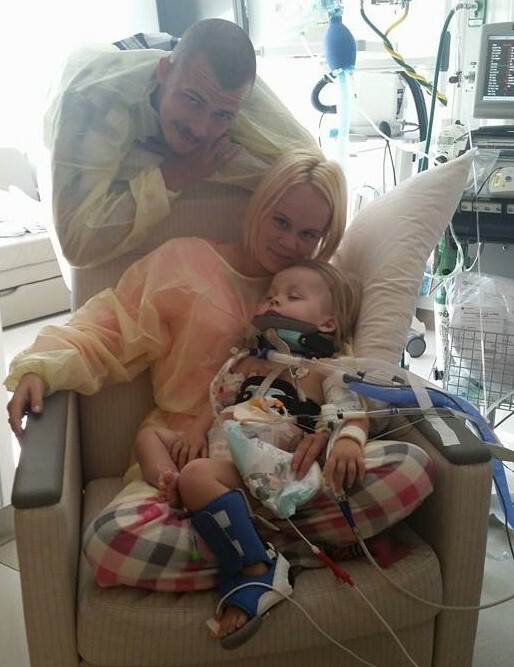 This is the first I knew of this precious family's struggle with the car accident, and although I don't have time to read all the updates, just reading your post, and watching the video just makes me tear up! What an incredibly horrific situation for them go to through, but at the same time, the power of prayer has made such a tremendous difference too! Thank you dear Cheryl for sharing this story with the updates and prayer requests, and I most certainly will be in prayer for the Brown family, and for little Ryker too! Much love to you today, dear friend! praying for Ryker, and the Brown family. Praising God for the wonderful praise report. Saying prayers. You have a lovely blog, and your header is beautiful. I just prayed for Ryker. Max's update is AMAZING! I am so proud to hear how well he has been doing without the vent! The Brown family has been through so much, and God keeps bringing them through with one miracle after another. I will continue to pray for both families. God bless you, Cheryl. Love you! I know what you mean...it is AMAZING to see what God has done, is still doing, and what I know He is still going to do for the Brown family. Such an awesome God we serve! I know you have prayed and carried their burdens, and I can not thank you enough. You are such a dear, precious friend, encourager, and prayer warrior....SO thankful to God to have you in my life. Love you so much! Hi Cheryl! I also prayed right away for Ryker, as Chris did. Oh my goodness, what a trial this family has had! But joy too, what a wonderful success story Max is. Prayer is heard, is powerful, is necessary. Thank you God for your healing grace, bringing joy and praise from all who hear it! Oh, thank you, sweet friend! And thank you for my wonderful, wonderful book!!!! I am so excited and can't wait to read it!!! You are a consistent blessing to me, and I can't thank you enough. Sending you much love and many hugs!! Sorry I've been MIA for a couple of weeks. A hectic time, and then vacation, and before I knew it, two weeks had passed! But, now that I'm catching up, I will be praying for these new requests. And celebrating the answers to prayer for the Brown children. God has done some amazing things in that situation! God's Word is stronger and more powerful than any report from Doctors, x-rays, MRI, etc. May these families continue to be amazed as God performs His will in their lives. 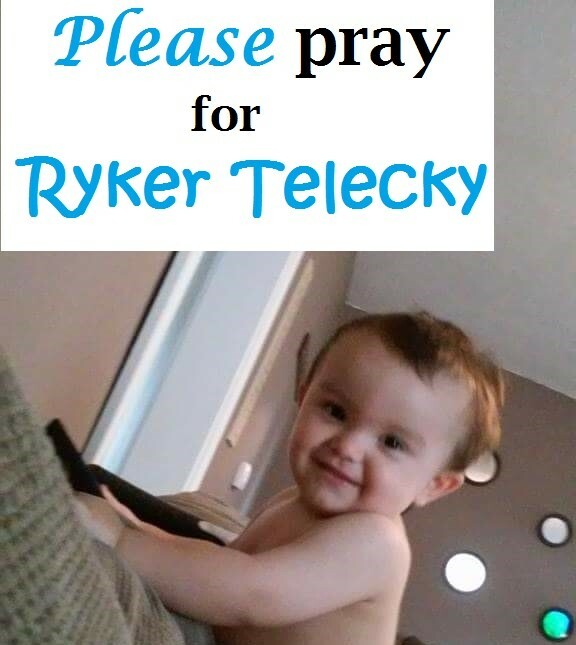 I prayer for Ryker that any tumors, blood clods, or hindrances to his brain, blood and body be removed in Jesus Name. May Jesus comfort these families and grant them HOPE for we must never lose our hope. Thanks for sharing with us here at Tell me a Story. Amen, dear sister!!! Amen, and Amen!!! God bless you! LOVING to be a part of this prayer family! !